It’s been a nerve-wracking several days for the inhabitants of North Carolina and South Carolina as they have dealt with the preparation for and are still enduring the effects of Hurricane Florence, which is now slowly spinning over South Carolina, still packing tropical storm force winds and drenching the region with record rainfall and flooding reminiscent of last year’s Hurricane Harvey in Houston. While watching the coverage of the storm online, we noticed a web cam set up on Frying Pan Tower off the coast of Cape Fear in North Carolina. The cam was set up focusing mainly on the American flag fluttering in the wind with the stormy seas rolling behind it. As time went on, the violent winds of Hurricane Florence battered and eventually ripped the flag to shreds. We thought: what a perfect visual metaphor for what category 5 shitstorm, Donald Trump, is doing to American democracy and rule of law. 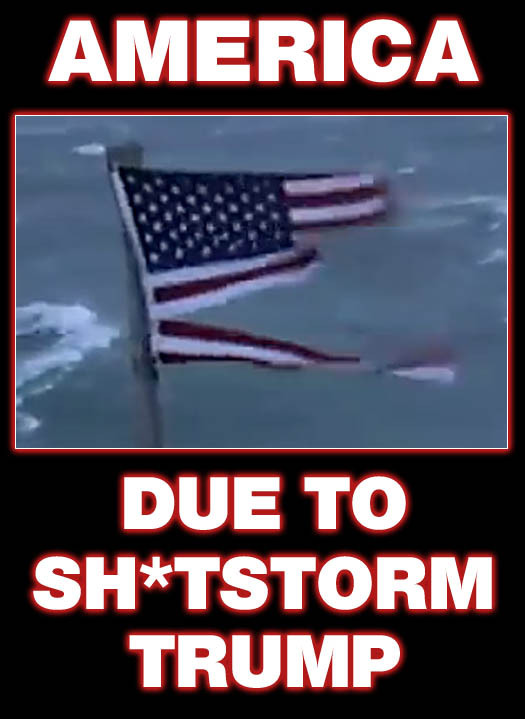 Much like Hurricane Florence demolished the American flag at Frying Pan Tower in North Carolina, category 5 shitstorm, Donald Trump, is shredding American democracy and rule of law. The 2017 Atlantic hurricane season has been one for the record books. It has been one of the most active in recorded history and has produced some record breaking hurricanes. Unfortunately, much damage and loss of life accompanies these monstrous storms. They can also shed light on people in power as well. George W. Bush completely botched the recovery effort for Hurricane Katrina in 2005 and it harmed his presidency irrevocably. The same is happening now with American CEO/Dictator Donald Trump’s response to the damage from Hurricane Maria in Puerto Rico. He has gotten pretty much a free pass from corporate media for the responses to Harvey and Irma, but he’s been receiving a lot of bad press with his war of words with San Juan mayor, Carmen Yulín Cruz. His appearance in Puerto Rico where he threw paper towels to the crowd was also quite strange, as he oddly stated that “I was having fun, they were having fun”. But a common thread among all the hurricane responses has been him talking to stricken people and telling them, “Have a good time.”(links here and here) Rex Tillerson was right about one thing, these are the actions of an absolute moron! Does he go to funerals and tell the grieving family members, “I can’t make it to the wake, but have a good time.” No, he actually tells a grieving widow of a military serviceman that “he knew what he signed up for.” Clueless, absolutely clueless! Speaking of clueless, then there is the story of Joel Osteen, who perceives himself as Jesus’ very own favorite son; very own fabulously rich son (check out Osteen’s $10 million dollar mansion). Most of America knows of his latency in opening up his gargantuan church for people seeking refuge from the flooding from Hurricane Harvey. But then this numbnuts has the stupidity to say that the hurricane is actually a sign of God’s love. So God must really love humans this year to the tune of $188 billion dollars in damage and 425 lives lost, not to mention all the people injured and lives disrupted or destroyed. The people in Barbuda, Dominica and Puerto Rico have had their islands completely devastated. It will take years for them to recover. Houston is still dealing with toxic waste issues from their leaking Superfund sites. But don’t worry folks; this is all because God loves you. Gee, we wonder what would happen if God hated us. But of course the most unbelievable thing is that after Osteen uttered his inane words, people still send him money and support his ‘ministries’. These are the same idiotic sheeple that support Trump folks and unfortunately, they’ve got the ears of most Republicans, who unfortunately, control this country. 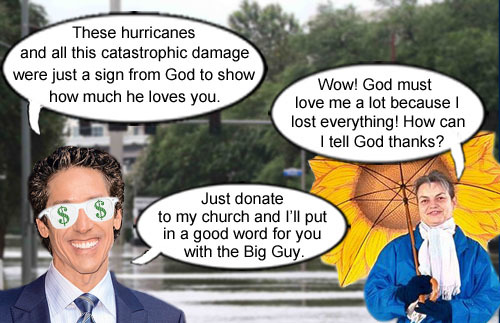 Holy huckster extraordinaire, Joel Osteen, compassionately lectures a completely devastated hurricane victim that her loss is just proof that God cares and that she should donate handsomely to his church to show appreciation for God’s undying love. 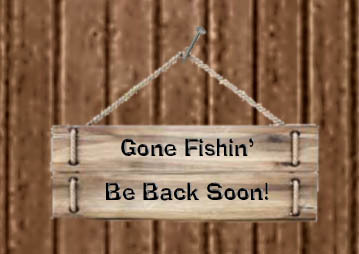 We’re taking a little break here at the Bucket. We’re big time science enthusiasts and although the results of hurricanes are terrifying, we find the science behind what makes hurricanes endlessly fascinating. These last two storms, Harvey and Irma, and their aftermaths have left us exhausted and depressed and it’s only half way through the season. You throw in Hurricane Trump and the Republican goons and…well…we’re taking a break. So we’ll be back in October. Hopefully by then, Robert Mueller will be closer to ending his investigation and maybe, just maybe, Trump will be wearing horizontal pinstripes. We’re taking a break America. We’ll be back real soon.